This is one of our most magical Canadian winter adventures. Imagine climbing aboard a train in Vancouver, sharing a glass of wine with fellow travelers, then being lulled to sleep as snow falls outside. Awakening in a Rockies winter wonderland, for a few days of discovery, fun, and indulgence. See the mountains of Banff and Jasper National Parks, blanketed in deep snow. Discover frozen waterfalls, winter wildlife, and spectacular views at each turn. Cozy up next to a fire in the evening, with a blanket of stars overhead. We’ll pair you up with the best activities – whether you’d like to race through the snow with a dog team or stroll along the floor of a frozen canyon. Experience the thrill of an overnight train journey from west coast Vancouver to the Canadian Rockies. Wake up in your private cabin surrounded by forests thick with snow. The cool, crisp air in Vancouver is invigorating as you start your Canadian winter train vacation. Vancouver’s relatively mild weather is a great introduction to a Canadian winter but look to the north and discover the winter scene you’ve been dreaming of – Vancouver’s coastal mountains stand before you covered in pure white snow. With a mild climate and so much to do, it’s no wonder people flock to this west coast city! Head out and explore Vancouver and surrounding area on one of the many activities there is to offer. Starting in Vancouver, you will be taken to one of the world’s largest population of bald eagles. From December until mid-February, these magnificent birds return to the area to feed on spawning salmon. This tour lets you view the eagles from the best place: on the river. In addition, you will travel along the scenic Sea-to-Sky Highway and enjoy views of ocean vistas, soaring mountains, and rainforest. You will return to Vancouver this evening. This is the best way to visit the main attractions and neighbourhoods of Vancouver in one day. Tour along the scenic harbour and through the historic areas of downtown Vancouver. Visit the totem poles at Stanley Park, browse art galleries and shops at Granville Island, walk along the Capilano Suspension Bridge and learn about the Pacific Salmon at the Capilano Salmon Hatchery. Enjoy the day exploring the city of Vancouver at your leisure. The Vancouver area is surrounded by some of the most stunning natural beauty in the world: mountains, ocean, rainforest, parks and beaches. This is a city like no other! With endless options for activities, sights and attractions, Vancouver is a city that begs to be explored. By coach or minibus, horse-drawn carriage or helicopter, bicycle or on foot, whatever your style, your choices for fun, excitement and enjoyment are limitless! A driver will meet you at your hotel and take you to the VIA Rail Station. This is one of the most memorable days of your Canadian vacation! The snow is glistening as you arrive in the mountain town of Jasper. Step off the train and take a deep breath of the fresh mountain air, you have arrived. Jasper is a great base to explore Jasper National Park – the largest park in the Canadian Rockies. Jasper is the gentle giant of the Rockies and this small mountain town offers visitors a more laid-back mountain experience with equal options for adventure, discovery and relaxation. Enjoy Jasper’s fluffy powder snow and spectacular mountain scenery on a snowshoe adventure. Join an experienced guide and explore the stunning natural surroundings of Jasper National Park. Take in the beautiful winter landscape around Jasper on a relaxing sightseeing bus tour. Your knowledgeable guide will bring the group to seek out and learn about the most iconic creatures and places surrounding the beautiful mountain town of Jasper. You will travel through the Athabasca Valley to some of the park’s most beautiful scenery. Sit back and enjoy the winter scenery from the warmth and comfort of a small tour bus. Experience the undisturbed beauty of winter with a dog sled team. Enjoy the crisp mountain air, then warm up with a hearty lunch cooked over an open campfire along the trail. Learn about the the history of dog sledding, and spend some time with your new-found furry friends. Welcome the fresh mountain air with a warm cup of coffee before you get ready to make your journey to Lake Louise today. Once there, you will have yet another wonderful landscape to admire and explore. Partake in the time-honoured tradition of Afternoon Tea at the Fairmont Chateau Lake Louise. Enjoy dainty finger sandwiches, buttermilk scones, homemade sweets and pastries whilst admiring the best view in the hotel. 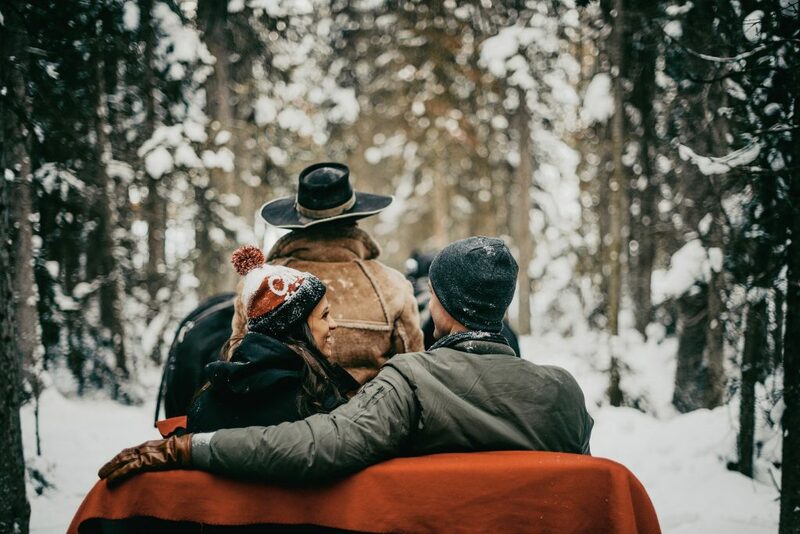 Later, a winter sleigh ride by horse-drawn carriage along Lake Louise is the perfect way to explore the beautiful winter scenery. Experience one of the most unique winter experiences at Lake Louise: dogsledding through Banff National Park. Travel by dog team along a beautiful woodland trail. This 30-minute tour provides a perfect introduction to mushing. Spend the morning at leisure in Lake Louise. Later this morning, travel the short distance from Lake Louise to Banff. Banff is the liveliest of the mountain towns on your Canadian holiday and the energy on Banff Avenue is contagious. With plenty of quaint shops to visit, the delicious smell of homemade maple fudge from nearby sweet shops will lure you in for a truly delicious experience. Add on a special dining experience at the top of Sulphur Mountain in the Sky Bistro with a menu designed to reflect the unique flavours of the Canadian Rocky Mountains. (Not available Mondays and Tuesdays). With the assistance of your headlamp, enjoy the beauty of winter at night as you light your way through Johnston Canyon with the help of ice cleats. Water cascades into this narrow canyon in the heat of summer but in the winter, the thundering falls freeze solid to create natural ice sculptures. Admire these glittering curtains of ice up close as you hike along a steel catwalk built into the rock wall. This popular ice walk will lead you past the lower falls and to the breathtaking upper icefalls. Travel through prime wildlife habitat and learn the clues to how Johnston Canyon was formed. Explore this mountain playground. The town of Banff is nestled amidst the soaring peaks of Banff National Park. Established in 1885, this is Canada’s oldest national park and has some of the most captivating scenery in North America, if not the world. The town itself is the liveliest of the Rocky Mountain towns, and the energy is contagious! It's small enough to walk around and home to world-class eateries and boutiques. Personalize your trip by adding a ski package in the Canadian Rockies and hit the world-famous slopes of Lake Louise and Banff National Park. Travel to Canmore today where you will meet a team of friendly huskies waiting to whisk you through the wilderness of the Canadian Rockies. You will have the option to harness the dogs and drive the team yourself, or simply enjoy the experience as a passenger. Either way, this is sure to be one of your most memorable Canadian experiences. After your sledding experience, warm up with a hot drink and tasty snack. Your Canadian Rockies winter trip comes to an end. As you head home, you take the great memories you made on this voyage, while you look forward to your next adventure in Canada. Enjoy the convenience of a private transfer to take you in comfort from your hotel to Calgary. The food tour in Vancouver differs depending on departure day. Sunday trip departures include a Best of Downtown Tour and Tasting, while Wednesday departures include a Granville Island Tour and Tasting. Half Day Train Journey to Dunster is only available on trips beginning on Wednesdays. Winter Wonderland Snowshoe Tour: Tours are weather dependent and require optimal snow conditions in order to operate and early December and April departure dates may be affected. Dog Sledding Tour from Banff: As tours require proper snow conditions in order to operate, departures in December, March and April can be affected and may not be able to run. Also, departures through out the winter season require temperatures above -30 Celsius to operate and will be delayed if it is too cold.